Achieve Parents Respond to the Olmstead Plan - Achieve Services, Inc. When the little silver car pulls into the driveway in the afternoon, all you need to do is look at the expression on Christopher Ferron’s face to know how happy he is to see his dad get home from work. When his sister, Renee, comes to visit, there is no mistaking the laughs and excitement, the abundant joy that those most familiar to him bring. His quality of life is enhanced in ways that words aren’t necessary to express. 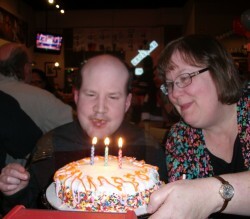 Christopher was born in 1985 with an unspecified severe disability that limits his communication and physical mobility. He also has epilepsy, which became life threatening in 2009, when he developed aspiration seizures. He was hospitalized a dozen times in 2009/2010. Since 2010, a very dedicated team of individuals have kept Christopher alive and free of aspiration seizures due to a strict eating/sleeping schedule he must adhere to. A key player in this team has been his day program, Achieve Services, in Blaine, Minnesota. Christopher attends Achieve on Monday – Friday where he spends his day in the work room. Christopher participates in several jobs brought in from the community including shredding paper, assembling gadgets, and putting together cards. Christopher is allowed to work at his own pace and receives a small paycheck based on the physical weight of the jobs he is able to complete. Some days he has the stamina to stay on task for a long period of time, other days he isn’t as strong. In either case, he is given the opportunity to complete the tasks at hand to HIS ability. Above is a photo of Christopher working on one of his jobs at Achieve. All you need to do is look at his face to recognize how pleased he is when a specific job is complete. While at Achieve, Christopher also receives non-work related programs, such as occupational therapy and opportunities to maneuver his walker or wheel chair throughout the facility to strengthen his muscles. He is given the self-help care needed to maintain his strict eating/sleeping schedule and meet his significant habilitative care needs. 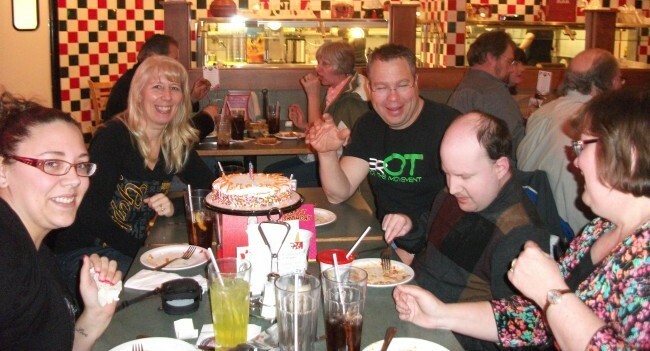 Once a month, Christopher utilizes his paycheck from Achieve to take his family out for pizza. Before working at Achieve, Christopher had never been able to earn enough money to do this. Below is a photo from his 28th birthday party which he was able to host himself. As the Olmstead Plan studies the needs of people with disabilities in the State of MN, please remember Christopher Ferron. I can’t think of a setting more appropriate to meet his needs than what the day program at Achieve affords him. Please do not eliminate the option of a day program for medically fragile individuals, like Christopher. The choices we make for Christopher are significant for his quality of life, but, also allow us to literally help keep him alive and healthy. When his mother’s little blue car pulls into the parking lot at Achieve in the morning, all you need to do is look at the expression on Christopher Ferron’s face to know how happy he is to see the buses arriving to bring his friends to work along side him, the abundant joy that those most familiar to him bring. His quality of life is enhanced in ways that words aren’t necessary to express.